A unique collaboration between San Jose Evergreen Community College District, and Milpitas Unified School District, the new Joint Use 21st Century Education Center provides 13,000 square feet of new classrooms for high school and college students. The classrooms are designed around a central courtyard and a Hub, to foster collaboration and learning. High school students will use the building during the day and college students will use the building at night. 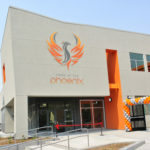 The new building provides lecture classrooms, biology lab, robotics, technology and standard classrooms. Designed to be LEED Silver, the building incorporates several sustainable and efficient building systems. 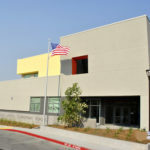 The Marin County Office of Education hired JL Modular to build a new continuation school campus on their current grounds. The four-building campus was built utilizing modular construction, but had several custom elements such as a curved roof and clerestory roof frames. The exterior of the building was clad with plaster and Hardie siding. Each building has large lower windows, clerestory windows, and solatubes to provide ample natural daylight. Large canopies and sunshades are provided at each doorway and at sun facing windows. 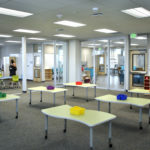 The classroom interiors are large, light, and bright and four of the classrooms are connected with a series of glass partitions and operable partitions to open up into one large classroom for collaborative learning. The campus was built to a high-performance modular spec and utilized natural daylighting and controls, reduced water usage, energy efficient HVAC systems, enhanced insulation, and recycled materials. Construction of a new three building campus on a 2.6 acre site designed to house 800+ students. The campus consists of a three story steel frame classroom, administration/library building, a tilt up concrete kitchen building. A free standing, covered walkway and outdoor seating area connects the three buildings. Project is CHPS certified.